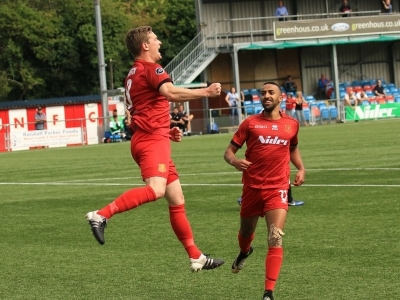 Nick Rushton scored twice on his return to the the squad as the Robins recorded a second home victory on the trot. The striker returned to the side after a two week absence, and opened the scoring in the first period. Both sides had chances in an entertaining clash, and Rushton took a second chance just after the half way mark. 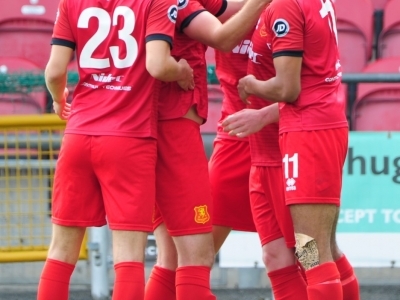 That is three games unbeaten for the Robins, and their first home victory against Bala in almost five years. 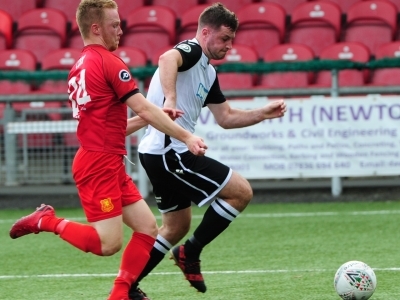 Chris Hughes made two changes to the side that picked up a point at Llandudno, as Steve Leslie came in for his first start in place of Sam Phillips. 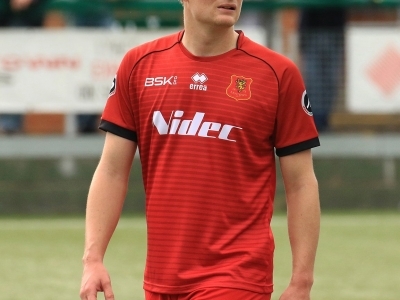 Nick Rushton also returned from his two week absence, with Ethan Jones dropping to the bench. On a sun soaked day at Latham Park it was the visitors who were quicker out of the traps, with a cluster of early chances. 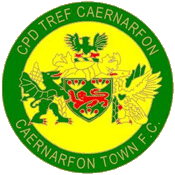 Anthony Miley glanced a free kick wide, before Henry Jones’ free kick sailed just over Dave Jones’ cross bar. Kieran Smith also fired over, but his afternoon was cut short soon after through injury, as he was replaced by Ian Sheridan. At the other end Newtown had their first chance of the game on ten minutes, after soaking up the early pressure. Leslie’s quality free kick to the back post was inches away from finding the unmarked Ben Bailey. Newtown had a string of corners with Leslie’s delivery causing problems for the visitors. Then on 22 minutes, the new strike partnership of Rushton and Joe Kenton linked up to hand the Robins the lead. 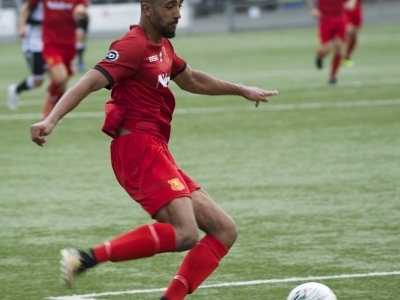 The Robins won possession in the middle, with Kenton playing a neat flick for Rushton who beat the offside trap and calmly slotted past Ashley Morris. 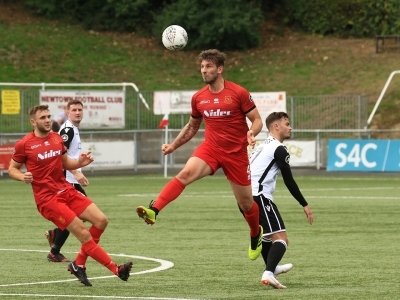 It was almost two soon after as a long Dave Jones goal kick was misjudged by Miley who flicked it into the path of Kenton, but Morris came out to smother the danger. Leslie had a free kick well saved, but it was the pace of Kenton that was causing issues as he was close to latching onto another defence splitting pass. Bala were looking for a leveler as Jones had a free kick saved, and Sheridan fired wide. Then some last ditch defending kept Newtown in front, as Kieran Mills-Evans through his body in front of a Mike Hayes effort from 12 yards. 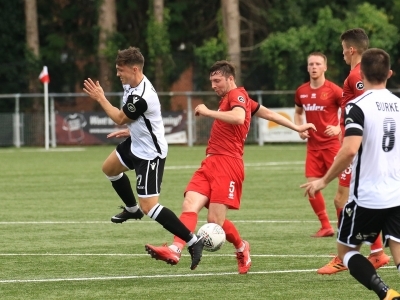 Bala were pushing for a goal before the break and it nearly came through a mix up between Jake Cook and Mills-Evans, but the ball fell safe for the Robins. Bala fired out of the traps in the second period, with Nathan Burke stinging Jones’ palms. 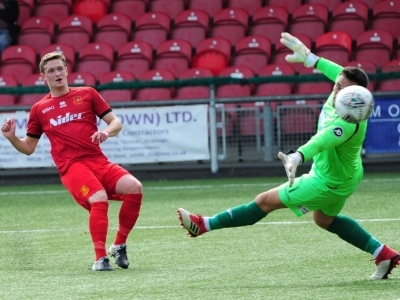 But within six minutes of the restart the Robins were two ahead and Rushton had a second. Leslie won possession in the middle of the field, and a quality through ball found Rushton who made no mistake as he fired past Morris. Newtown were continuing to have joy on the break with Bala leaving gaps, but the ball wasn’t falling for them. Leslie flashed a shot wide with his wrong foot, before Bala began to come back into the game. They were building up pressure, with Jones getting down low to deny a Burke effort, with Miley flashing a volley wide from the resulting corner. Newtown were still looking likely to get a third as Alex Fletcher hit the side netting with a shot. Then Ethan Jones ran clear and crossed for Neil Mitchell, but he could only fire straight at a defender. 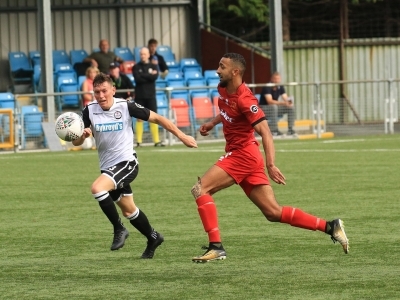 At the other end Jones had a testing effort saved, as Bala tried to put some late pressure on. But in the final minute Rushton almost completed his hat-trick as he chipped Morris, but his effort hit the post.